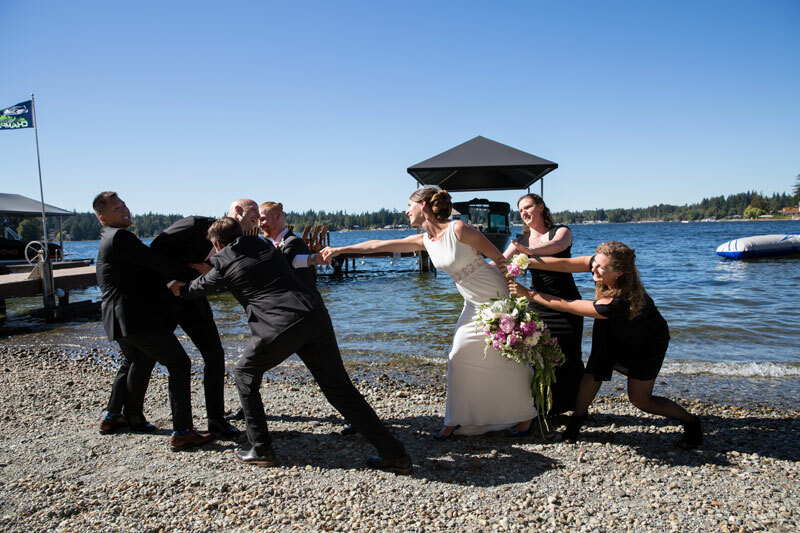 Jess and Sayer got married back in December, but they held a reception for their friends and family over the Labor Day weekend at a beautiful rental house on Lake Goodwin in Stanwood. They are both in the military, and Jess coordinated much of the event over emails and phone from Afganistan! I was so excited to finally get to meet them on their big day in person, and I wasn’t disappointed. It felt like hanging out with old friends. The day itself was absolutely gorgeous. The lake shimmered in the afternoon sun, and the couple decided to play bartender themselves during cocktail hour as a way to interact with their guests. (Totally stealable idea, guys!!) There were shenanigans, dinosaurs, and a speech from Sayer’s dad that had everyone laughing.